Vintage 1950s to 1960s Clifford Pier & Sea Front Singapore pennant banner. 24 inches long, blue and white in color. Estate purchase. 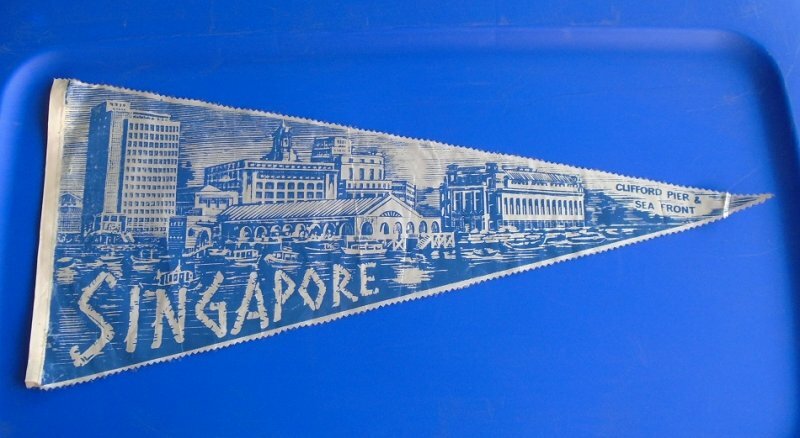 This pennant is from the Clifford Pier & Sea Front in Singapore. It is blue and white in color and is possibly made of a satin type material. The vertical side measures 10.5 inches long and has an opening for sliding in a small pole or something to hold it by. The horizontal side measures 24 inches long. When held up to the light I can see a tiny pin hole where it was probably tacked to a wall. I'm guessing this pennant is from the early 1960s. If so, it's still in very good condition. You should be able to see in my photo that the pointed end has a fold about one inch from the tip. That fold has caused thinning at that spot. I'm sure you can iron that fold out though. Delivery will be via USPS First Class Mail Parcel from California. Buyer to pay delivery charges of $4.10. I gladly combine shipping on multiple items purchased. It is best if possible to contact me first to let me know which items you'll be purchasing so that I can adjust the shipping charges, otherwise at checkout you will be charged the full shipping fee for each item. Should that happen, and if appropriate to do so, I refund a portion of those charges.